The industrial plants and the harbor of Ravenna had strong influence on the northward neighboring coastal pinewood Pineta san Vitale. This was shown in 1973, when the crown density of Pinus pinea (L.) was declining with a north-to-south gradi- ent of decreasing distance to industrial plants. Now – over 40 years later – exhaust filter and wastewater systems have been installed to reduce pollution. But have these improvements an observable effect, regarding the crown densities and therefore the health conditions of the adjacent pinewood? Our analysis of trees shows once again, crown densities of P. pinea decline significant in correlation with a smaller distance to the industrial zone, and also crown densities of Quercus robur L. decline with a strong tendency. Therefore industrial filter system improvements seem to be not sufficient. The subsidence caused soil salinization of the region was additionally tested to be an independent factor for defoliation. In this regard, negative con- sequences on the crown density of P. pinea were found to a high extent. Finally our results show, coastal forests as natural reserves of international importance are influenced by many – often anthropogenic caused – impacts. The need of further improvements in filter systems and also an ongoing critical view on effects of urban and industrial surroundings on natural areas under human pressure is strengthened in the common sense of nature protection. Plants added to an IPM cropping system can potentially enhance establishment of beneficial organisms and thus improve the efficiency of biological pest control in IPM greenhouses. However, despite the clear function of their presence, there is a lack of scientific knowledge about the way the additional plants function precisely. In the present study, we analyse one aspect, the importance of the presence of domatia for the presence of the phytophagous mite Tetranychus urticae and the predatory mites Neoseiulus californicus and Phytoseiulus persimilis. We employed eight potential banker plant species differing in plant architecture, the presence of pubescence, domatia or waxes, leaf texture, etc. The purpose was to identify which plant functional types enhance the reproduction of predatory mites, which banker plant species the predator and pest prefer, the characteristics of these plants and the factors responsible for this choice. We observed the distribution of all pest and predatory mite species on each plant species infested artificially, including roses as ornamental crops, after 12 weeks. The results showed that spider mites (T. urticae) and predatory mites (N. californicus, P. persimilis), plant growth and the development of both pest and predator mites were clearly affected by the presence of banker plants. No banker plant species was infested by T. urticae, contrary to bt the ornamental rose crop. Two plant species were responsible for best predator installation and rose growth, both of which had acarodomatia on their leaves which favoured the installation of predatory mites. Leaf number and height increments showed no significant differences in infested and non-infested plants of the eight plant species. In this experiment, we identified two plant species as efficient banker plants, Viburnum tinus and Vitis riparia, which hosted predators and not pests. Both are well adapted to the local Mediterranean climate and can easily be grown in open fields and greenhouses in the region. Their high tolerance to temperature extremes and drought is advantageous in the light of climatic changes to be expected. With this knowledge, practical solutions for biological pest control as an alternative to chemical control can be optimized with the aid of additional plants in the system. Mediterranean ecosystems are spatially diverse and temporally dynamic systems that are subject to excessive human interference. Diversity of the Mediterranean landscapes lead to complex landscape management issues that decision makers should deal with. It also attracts scientists to use new tools and employ new techniques to understand these landscapes. For these and many other reasons Landscape Research Society (PAD) in Turkey decided to hold a Landscape Ecology Congress with a main topic “Understanding Mediterranean Landscapes: Human vs. Nature”. The Congress took place in Antalya, Turkey, in October 2014 with 85 participants from all over the Mediterranean basin. Few contributions from outside the Mediterranean basin were also present during the event. IALE, IALE Europe and Society for Conservation Biology supported the event. In response to call for papers, we received over 90 submissions from 17 countries. 62 papers were accepted and they were presented during the Congress. During the post-congress period scientific committee selected 8 papers for possible publication in JME. Finally, 6 papers were selected for publication in this special issue. Cases from Turkey, Italy, Tunisia Israel, Cyprus, and Romania were selected to represent a wider geographical coverage and diversity. Many colleagues contributed to the success of this issue. I take this opportunity to thank all authors for their submissions. I am indebted to reviewers for their valuable time and effort to review papers in a timely fashion. Last, but not least, I am also indebted to Professor Almo Farina for providing this opportunity. Particular investigative tools are needed to understand the ecological dynamics of the complex land mosaic across the Mediterranean region that is the result of human intervention over thousands of years. Landscape ecology and the associated study of soundscape ecology are two disciplines that are able to construe the challenges posed by such human disturbances, which have created distinct and fine-grained, cultural landscapes. 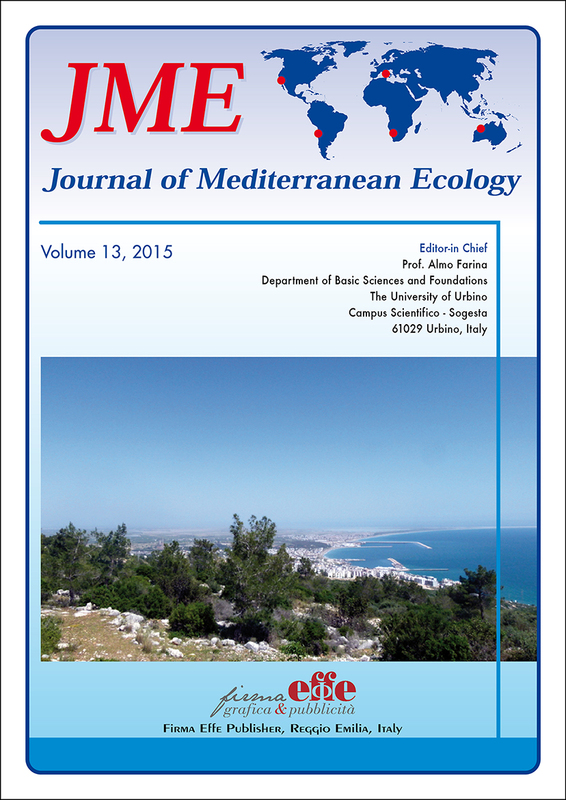 The aim of this paper is to consider a research agenda guided by an ad hoc ecological theory that is able to examine and interpret the complexity observed in the Mediterranean landscape. Assessing the ecological integrity of landscapes in Cyprus. Landscape Character Assessment (LCA) has gone a long way since its early development in NW Europe. LCA should go beyond the simple characterization of landscapes and must support reasonable judgements about the condition of the landscape, including its ecological integrity. Although some progress has been made in this direction, what still remains understudied -at least in a Mediterranean context-is the validity of the framework in general and for ecological applications in particular. This paper explores whether, in the absence of detailed habitat mapping, LCA can be used as a surrogate for assessing ecological integrity. In other words, how well does the countryside function as habitat for wildlife? The paper attempts to answer the above question using Cyprus as a case study, a country where there is a significant gap in detailed habitat mapping. Cyprus has recently completed a landscape map for the whole island based on mapping natural (soils, geology & landform) and cultural (land cover, settlement pattern) variables. Ecological integrity was measured in the field, to capture important properties of broad habitat types such as composition and spatial configuration, and management in- tensity. The results based on a statistical comparison between ecological integrity condition and landscape character types (LCTs), demonstrate a significant relationships. This confirms that potentially LCA, coupled with rapid habitat surveys can deliver an effective and reliable tool for assessing the ecological integrity of different landscapes. The study is presenting the results of the tree assessment survey carried out over a segment of Aviatorilor Boulevard – an important part of the Romanian green heritage which is also an existing green corridor that links two of the most important landscaped spaces of Bucharest: Kiseleff Park (one of Bucharest’s first public gardens) and Herastrau Park (the largest urban park of the city). Beside more deeply inquiring the vegetation status – by adding several new analysis criteria – the study is presenting the outcomes in comparison with the results obtained in 2009 through another study conducted on the same area. The outputs revealed that meantime the overall state of the vegetation worsened although several new additions were made. The gathered data have enabled also the generation of a more accurate image regarding the vegetation’s condition embedded within this site. The survey’s structure allowed the formulation of some consideration toward the interventions needed in order to stop the vegetation decay and for the future rehabilitation of the ensemble. Land degradation is intrinsically complex and involves decisions by many agencies and individuals, land degradation map- ping should be used as a learning tool through which managers, experts and stakeholders can re-examine their views within a wider semantic context. In this paper, we introduce an analytical framework for mapping land degradation, developed by World Overview for Conservation Approaches and technologies (WOCAT) programs, which aims to develop some thematic maps that serve as an useful tool and including effective information on land degradation and conservation status. Consequently, this methodology would provide an important background for decision-making in order to launch rehabilitation/remediation actions in high-priority intervention areas. As land degradation mapping is a problem-solving task that aims to provide clear information, this study entails the implementation of WOCAT mapping tool, which integrate a set of indicators to appraise the severity of land degradation across a representative watershed. So this work focuses on the use of the most relevant indicators for measuring impacts of different degradation processes in El Mkhachbiya catchment, situated in Northwest of Tunisia and those actions taken to deal with them based on the analysis of operating modes and issues of degradation in different land use systems. This study aims to provide a database for surveillance and monitoring of land degradation, in order to support stakeholders in making appropriate choices and judge guidelines and possible suitable recommendations to remedy the situation in order to promote sustainable development. The approach is illustrated through a case study of an urban watershed in Northwest of Tunisia. Results showed that the main land degradation drivers in the study area were related to natural processes, which were exacerbated by human activities. So the output of this analytical framework enabled a better communication of land degradation issues and concerns in a way relevant for policymakers. Here we present a case study using modern ecological data (collected over the period 1948-2014) to assess changes that took place in plant and animal occurrences in the 12th century BCE in Philistia – the southern coastal plain of Israel and the Judean foothills in its immediate hinterland, as a result of either shifts in anthropogenic behavior or climate. Using published archaeobotanical and archaeozoological data from several archaeological sites in this region (e.g. Tel Aphek, Tell es-Safi/Gath, Tel Miqne/Ekron, Ashkelon), we compared habitat associations of these palaeo-assemblages to observations on modern plants and animals from the same geographic region. Multivariate analytical methods, DCA and CCA ordination, showed mesic to xeric gradients in both the modern and the archaeological data. The clearest pattern in the archaeological data was a separation of Late Bronze Age (mesic) from Iron Age I and Iron Age II sites (xeric). We interpret this shift as reflecting the decrease in rainfall between the Late Bronze Age (ca.1550-1180 BCE) and Iron Age (ca. 1180-586 BCE) periods, a phenomenon that has been documented in the Eastern Mediterranean in general by other palaeoclimatic proxies (e.g. pollen, cave speleothems and the Dead Sea level). Anthropogenic pressures present a significant threat to natural landscape connectivity and cause habitat fragmentation. This is also the frequent case for Mediterranean landscapes. The study areas of Urla and Seferihisar are coastal settlements in the Izmir metropolitan area. Once, Izmir was a relatively small Mediterranean coastal town with a low-density settlement character in the 1960’s. It became a metropolitan city that sprawled along the transportation network and coastline towards Urla to the west and Seferihisar to the southwest. Urla and Seferihisar have also been subjected to suburban development in the vicinity of the metropolitan city of Izmir. These cases, therefore, present good examples of assessing landscape frag- mentation and connectivity based on urban development and transportation networks. This study examined Mediterranean shrubland and the degree of forest fragmentation and connectivity that was caused by a transportation network and urban expansion for 42 years. Shrubland and coniferous forests in Mediterranean landscapes are the dominant natural land covers and important wildlife habitats. The fragmentation and connectivity were quantified on the basis of 1963 and 2005 land use/cover and transportation maps using Area and Edge Metrics (CA-class area, PLAND-percentage of landscape, GY- RATE_AM-radius of gyration, AREA_MN-patch area distribution), Aggregation metrics (PD-patch density, LSI-landscape shape index, NP-number of patches, and ENN_MN-euclidean nearest neighbor distance distribution). Furthermore, with Ordinary Least Square Regression Analysis, it focused on identifying the influence of urban development and a transportation network over forest and shrubland fragmentation. The results showed that road density was significantly related to the fragmentation, while population density and proximity to urban areas had no significant effect.